Magic tricks can be simple and at times they can be very complicated. If you are just doing this for fun or maybe to impress a girl, there are three magic tricks you can do by using a coin. The first trick is how to make a coin disappear. For this, you will need a coin, a piece of paper measuring 5 inches by 5 inches, a handkerchief and some tape. If you don’t have a coin, ask the person you are with if you can borrow one. Get the piece of paper and show both sides so they will notice that it has not been altered. When you are done, put this paper flat on the table with the coin in the center. Next, fold the paper in half leaving about half an inch in between the top and the half that has been folded. You then fold the right side of the paper around the back to the halfway mark and fold the left side back over this half. Fold half an inch of the top of the paper down so it appears you created a packet. Hold it in front of them and let them touch it to let them know the coin is still there. You make one turn and with your back to the audience, you slip out the coin. You then pick up the handkerchief and put the coin down in the same movement. You then cover the paper with the handkerchief and give this to the person. Say some magic word, lift the handkerchief and let the person open the folded piece of paper to discover that the coin that was placed in there disappeared. After you ask them where is the coin, you show it and hand this back to them. The second trick is turning a dime into a quarter. This is where you will be using the tape and two sets of coins. Before you begin, make sure the quarter is already taped in your hand so you can make the switch later on. You then ask the person for a dime. 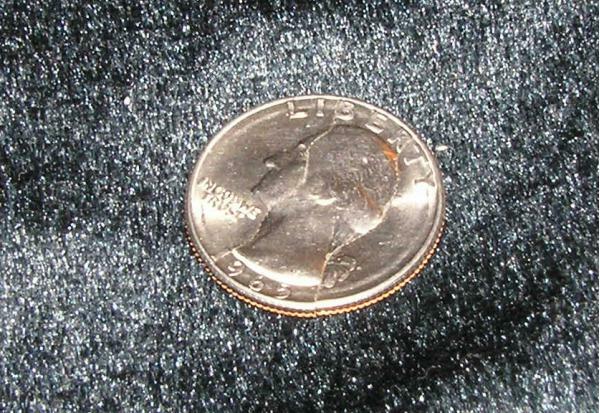 Once it is given, you hold on to this tightly in between the thumb and index finger of your right hand so you will be able to slide the quarter into position behind the dime. Use your left hand to press the dime onto the tape covered side of the quarter and use your fingers to squeeze these two together. Then it is time to take the coins between your left thumb and index finger and turn the hand so that the face of the quarter can be seen. Now drop the coin quickly into your right hand to make them think that you only used on coin for the trick. Another trick is called Bend the Coin. For this, you will need to buy a coin that can bend in two or three places which is available in the magic store. You ask for a real coin that is the exact size of the one you are using and write your initials on it to make the person believe you didn’t switch it. With the hidden coin in one hand, you make the switch and pretend that you are using a great amount of effort to bend it. After some time, they will see that the coin is bent and then quickly switch and return to them the original coin.